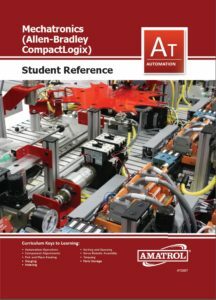 Amatrol’s 87-MS3, Orientation-Processing, is station 3 of the 870 Mechatronics Learning System. 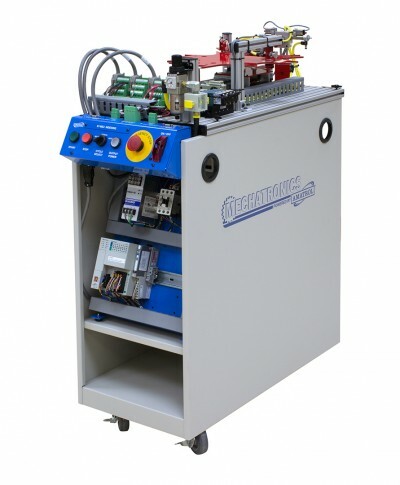 The 87-MS3 station is a small mechatronics system in itself with multiple, integrated technologies that can be used stand-alone or in combination with other stations. Industrial safety and operation are emphasized on all Amatrol mechatronic stations. The Orientation-Processing station teaches interfacing, problem solving, programming, sequencing and operation for index tables, stepper motors, homing sensors, fiber optic sensors, part transfer, parts orientation, and capacitor sensors. 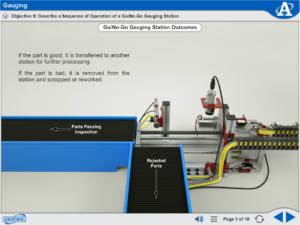 This station performs the role of parts orientation and an optional simulated machine operation in the process of assembling a working industrial directional control valve. The 87-MS3 is a mobile workstation with slotted work surface that contains an operator station, 8-station rotary index table, pick and place pneumatic robot, fiber optic gauging module, part transfer module, finished parts storage module, parts set, a pneumatic distribution module as well as an electrical distribution module, an electro-pneumatic valve manifold, and a digital I/O interface module.